Hi, my name is Vondra. I like exploring outdoors. A couple of weeks ago, I went to Champoeg State Park. I was walking around with my mom and I found something called an Oak Gall. Today, we are going to learn about Oak Galls. Hola, me llamo Vondra. Me gusta explorar afuera. Hace unas semanas, yo fui al parque de Champoeg. Estaba caminando con mi mamá cuando encontré algo interesante que se llama una agalla del roble. Hoy, vamos aprender sobre las agallas del roble. Oak-Gall-Eyes. Image courtesy of Vondra and Lena Baucum. 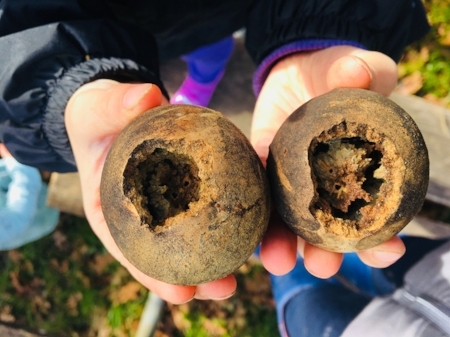 Oak Galls are sphere shaped scabs that grows on trees, especially Oak trees. Agallas son roñas en forma de esferas que se forman en los árboles, especialmente en los robles. A single Oak Gall. Image courtesy of Vondra and Lena Baucum. They are caused by a little bug called a Gall Wasp. The Gall Wasp lays its egg on a part of the tree. The tree protects itself by forming a gall. When winter comes the gall falls off of the tree. When spring comes, the baby gall wasp makes a hole to fly out. That is what causes the holes in the galls. Las agallas se producen por causa de un insecto que se parece como una mezcla de mosquito y mosca. El insecto inyecta su huevo en el árbol y el árbol produce una agalla para protegerse. Cuando es el invierno la agalla se calle del árbol en unas hojas muy suaves. Cuando llega la primavera, adentro de la agalla el insecto hace un hoyo para salir de la agalla. Cuando ves a una agalla puede ser que tiene un hoyo. Si no tiene, es porque el insecto todavía está adentro. Oak Gall hands. Image courtesy of Vondra and Lena Baucum. The galls do not hurt the tree because the gall is the way that the tree protects itself from infection. 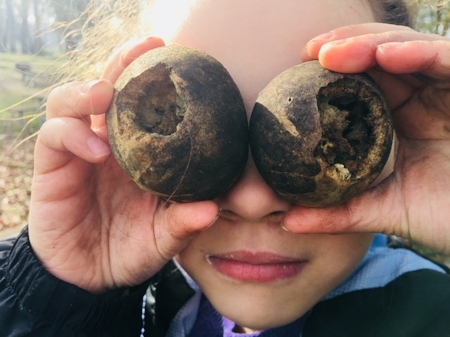 So you do not have to be worried if you have oak galls. If you have an Oak Tree, then you should go out and see if you find any oak galls. No necesitas preocuparte si su árbol tiene agallas porque las agallas son una forma de protección. Si tienes un roble, ve a mirar afuera a ver si puedes encontrar unas agallas en su árbol. At just six years old, Vondra shares a love for exploring and learning about nature. As the daughter of our Education Coordinator, Lena Baucum, she frequents our office in the Eco Hub and shares stories about her recent experiences in nature with our staff. She is bilingual in English and Spanish and enjoys speaking and writing in both languages.